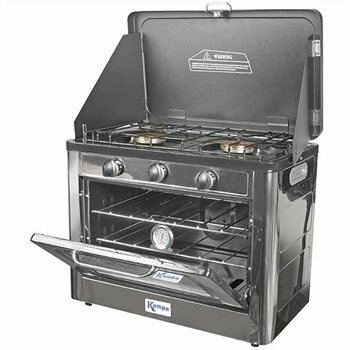 The New Roast Master from Kampa allows you to cook all your favourite dishes from the comfort of the campsite. This unique new product brings a whole new meaning to cooking whilst camping, whether it be your traditional Sunday roast, jacket potatoes, cakes or muffins – the Roast Master can do it all. Highly popular and always sold out at the end of the season, the Roast Master is in a class of its own and is a must have accessory for avid campers. Great for camping! We ordered it for shipment to the Netherlands. Arrived within 3 days after ordering,undamaged. Great track n trace service. Oven heats up quite fast and can keep 2 normal sized oven shells minimum. The hobs are quite powerful, water boils in no-time. Uses less gas than we expected. Take your furnace with you on the go! I ordered a Kampa Roast Master Double Gas & Oven on Saturday the 21st Nov it arrived on Tuesday the 24th nov. I would just like to say a BIG THANK YOU for your prompt and fantastic service you have provided. I will definitely use you again. This is a christmas present for my mum and dad they will be well pleased with it as they spend half their life camping. Thanks again. We bought 2 of these ovens to use at our Scout Group family camp. They were abosultely fine and catered brilliantly for 50 people. The only problem we had was that, on a normal camping table, with a large saucepan on the top our cook couldn't see into the saucepan and we had to find her a box to stand on! So maybe Kampa could consider making a stand which is lower that a table to overcome this problem.